Pole Station in Antarctica. 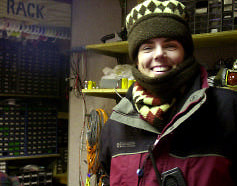 Katy Jensen, who now lives in St. Paul, was the Station Manager there from 1992 – 2002. She will be sharing her polar experience on Dec. 5 at 10:20 a.m. in the Hoversten Chapel as part of Augsburg’s Vocatio Series. Jensen earned her degree from Colorado College and later joined the National Oceanic and Atmospheric Administration’s Commissioned Officer’s Corps. After serving 2 years aboard research vessels conducting oceanographic mapping and surveying missions, she was assigned to the U.S. Antarctic Program. That turned into a 10-year-long adventure of days with endless sun and others of perpetual night. Jensen’s speech in chapel is part of the “Science as Vocation” Vocatio Series, which is supported by Exploring Our Gifts: The Lilly Grant at Augsburg. There will be a lunch with Katy Jensen after chapel for those who would like to discuss her experiences. Please contact Ross Murray at murray@augsburg.edu to RSVP for the lunch. Is etiquette still important in business?